Welcome to the latest edition of Cast & Hue’s Five on Friday newsletter. Each Friday, we deliver a quick summary of five items of note associated with the evolving healthcare consumer, strategy and marketing. We hope you find it interesting and useful! We are proud to announce that we will be expanding our industry-leading, patient experience consulting services under a new name, Cast & Hue. Learn more about Cast & Hue, our methodology, and how we’ve helped companies like Aetna, Insight, Sharp HealthCare, United Way, and OhioHealth see the people they serve in a different light. Click through to read the origins of our company, and what drives us. 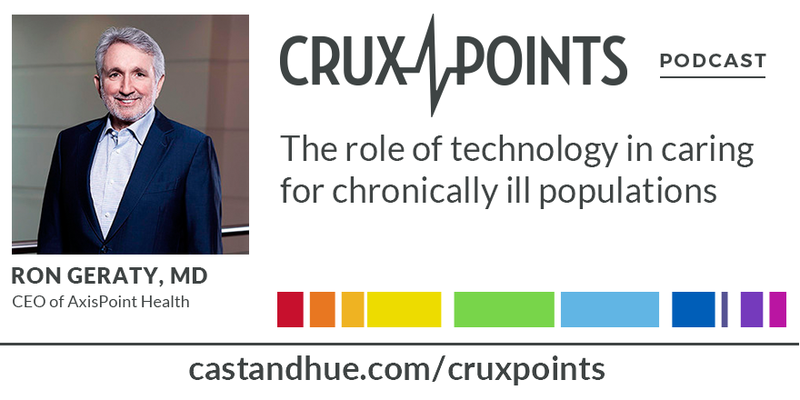 Ron Geraty, MD, CEO of AxisPoint Health, joins the podcast to talk about managing the care of chronically ill populations. Look forward to Dr. Geraty sharing his view on the role technology plays in population health today as well as the two biggest threats to treatment adherence. There is no doubt that there is room for improvement within any organization, but this is especially true in healthcare. There are many tools for the job, but with the trend towards heightened expectations from customers favors some methods of improvement over others. In this article by Stanford Medicine, they talk about the role of design thinking in improving health systems with a focus on the patient experience. Using tools such as design thinking workshops, journey mapping, and co-creation, Stanford teaches their students to take an innovative approach to solving problems they may encounter. This is also how we at Cast & Hue help our partners. By positioning empathy and collaboration high in every project, and supporting that with design thinking and an innovation culture, we tackle customer problems while keeping the needs of all stakeholders in mind. This article is an interesting read, so be sure to check it out. Every tool has it's place, and design thinking is a great way to get to the root of the problem. Transparency is a hot issue in healthcare right now. Still, there is a glaring lack of actionable data around cost, quality, and value. Even when those metrics are available, it can be tough to compare them between providers. Consider two doctors, one double the price of the other. Is that price worth it? How is that even decided? Is that based on value, quality of care, the experience? Castlight is a company trying to change all that. Their product is focused on not only making sense of the various data sources available, but also using that data to encourage employees to make better decisions. They also help employees to understand all the benefits within their health plan. For example, instead of back surgery, the platform can point them to try physical therapy first. This article in the NY Times features Castlight and their role in shedding light on the murky world of healthcare finances. Rural communities have their own unique set of challenges around healthcare. Between communication issues, staffing challenges, and resources for people dealing with chronic conditions, it can be challenging to prep for responding to any and every possible injury. In Ajo, AZ, a small clinic, the Desert Senita Community Health Center, is the closest provider of healthcare for their 2,300 residents within 100 miles of the town. In this article, The Atlantic takes a look at how they operate, and how they adapt to the challenges put before them. It also explores how the residents adapt to recieving care in such a rural area, hov rural clinics are financed, and how the clinic takes on a population health role within the community. That is it for this week. We hope you find value in this newsletter and invite you to share your thoughts in the comments section.